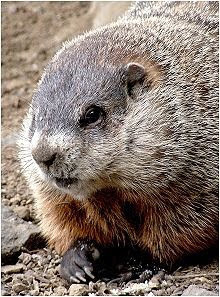 Groundhog Day - that day when that tiny animal as it emerges from its burrow should it produce a shadow it disappears rapidly underground to sleep the next six weeks away .. announcing from its behaviour that Spring is not yet here. I’m not sure how that plays out here on a grey, wet English day .. and we don’t have groundhogs – so our pronouncement that Spring is here is made by regulatory edict, printed up and if by some miracle we have a heat wave earlier and Summer arrives unannounced in March – then we’re stumped, because Spring has just been ticked to begin on the calendar. 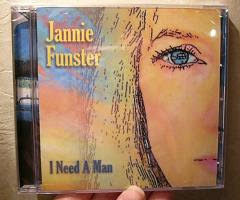 A picture of Jannie's CD "I Need A Man"
I have also learnt that in the States you have official holidays, while other religious, ethnic and traditional holidays populate the calendar – but are rarely observed by businesses as holidays, while are known as Hallmark (card) holidays! Perhaps we should be groundhogs – then we can go back to bed for another good sleep? This custom was brought over to the States from Germany and is, to this day, traditionally celebrated in Pennsylvania. It seems to have taken its origins from European weather lore, and pagan festivals – when the badger or sacred bear would have been the prognosticator. No doubt most of you are wiser than I am .. and will have seen the film? So I can leave groundhogs and the coming of spring to their own devices. It’s also Candlemas (40 days after Christmas) – now that’s important .. because those of us who have been lazy and had left the decorations up – definitely need to make rapid plans to take them down by today: Candlemas! On a more serious note this day is also known for the Presentation of Jesus at the Temple, as well as for the Feast of the Purification of the Virgin, and for the Meeting of the Lord. It celebrates an early episode in the life of Jesus and is celebrated by the Catholic Church, the Eastern Orthodox Church and by the Church of England. Now this too is a Funster day .. did anyone tell you? Me neither, but I won a prize before Christmas .. which themselves managed to tell me about the day before my birthday – good timing eh? I love this one - Jan describes this picture as "Jan - Square" .. if you look at mine it's described as "Hilary - Good" .. that was at that stage of exhaustion! See what we say of ourselves behind the scenes .. Jan doesn't look square to me! I love Blue Bunny’s mother tongue .. and actually on groundhog day is appropriate .. it’s a mix of Dutch, German, Afrikaans and Huguenot .. so you can see Jannie and BB spread their love and laughter around the net – making us all wake up to smiles and joy. Now I really did receive a prezzie prize - for the best comment on that post .... through the snow and over the ocean came this wonderful CD – courtesy of the songster herself – if you click through to her site – three of the songs on CD are featured there .. “Sugar Lady”, “What’ll I DoWith Me” and “I Need a Man”. By the way you can’t go over yet – you have to finish and you have to comment?! I’m really enjoying listening to her melodic voice, together the with accompaniment – I exhort you to have a listen .. but more importantly to buy her CD – unless there’s another prize going soon .. but you may not be as lucky as me .. so you’d better buy – it’s just a click away! Jannie’s description of herself on the CD is somewhat different to the sugar sweet, laughing damsel that flutters around the blogosphere .. first she is Jannie the First – did you know that? – could there be another .. oh oh .. Kelly features too .. under my favourite number 13 as the smallest songster (ever probably .. nearly!). Then the description continues ..that she’s a Canadian born-and-bred expert kindling chopper, adroit cow milker, chocolate cream pie eating contest winner and soup aisle fandango maven – now that tells us! So I have this wonderful CD which is playing away .. and then there’s a lovely Thank You Card with a few other wonderful words on it and an explanation of a photo showing Jannie the First, a mere 15 years ago, and the house they used to own across the Bay. That's one of them things .. the groundhog! Happy times – keep blogging – keep smiling – be generous – keep giving – just live life to the full as Jannie does .. as calmly as Jan does ..
Dear Mr Postman – yes a different sort of post – you can meet some of my friends .. it makes a change and it was a real treat to win a prize .. lucky me .. or as Jannie would say ... whoooo hooo. Blue Bunny and Hardwick are mates – and my Ma thinks that my friends from around the globe are wonderful .. she loves hearing about them! My Ma was sleeping most of the day today – but she seems better, and as long as we can sort her hearing out then I shall be relieved .. not be able to communicate .. is tricky. Woa, hahaha, well this sure is an inspired post and of course it cannot be any other way when you feature Jannie, bunny and Jan.
Hilary, you are hilarious and my 13 face muscles are working while commenting. It is great to be a winner. What a sweet lady. We find the best of friends on blogs. Glad to count you as one of our friends. Groundhogs are only right 39% of the time. It is still fun. Thank you for all the great info on them. Hi Wilma .. thankyou .. it was such a cheering box to receive from across the pond - especially as it's been so miserable here (though we've had it relatively easy down here). The CD is lovely and I think I'll have it playing away giving me inspiration as I blog along. We are so lucky that we can laugh as we play and work along in our blogging world and it's amazing that we can connect with such enjoyment. Good to use those 13 muscles .. must remember that .. it doesn't take much to change others' lives. Hi Dan and Deanna .. thanks for being here .. glad you enjoyed the story. Yes it was fun to be the winner - most unexpected .. not normally my forte! I imagine groundhogs aren't right very often - but it's like the toss of a coin .. sometimes they will be! Still it's, as you say, fun. That's just awesome --- all of it: the groundhog tradition, Candlemas, Jannie, Jan, and (not in this post) the YouTube video I'm watching/listening to of Blackbirds singing. Thank you, Hilary! May spring arrive in short order, not making us wait through the gray much longer. Hi Megan .. thank you - yes I was pleased to find the blackbird YouTube video .. it's a great song to listen to .. I heard one here this morning. Jannie's done so well producing her CD and it's a lovely set of really super songs and melodies .. I love it. Hi Hilary. I have Jannie's CD and love it. I like Motorcycle Cop and Wedgie Wedding. :-) Your description of "sugar sweet, laughing damsel that flutters around the blogosphere" is absolutely perfect! Hi Davina .. thanks - it is such fun to listen to - and the 'word' Wedgie .. I'd only heard a friend use it all the time of his wife & she's so slim! ..Mind you so's Jannie! Love the term. My favourites are Sugar Lady and Hurricane Jane, but Kelly's is a delight .. especially when she forgets her words & says 'oh yes' .. and carries on - that's great Jannie included it. So pleased you liked my description .. it's so true .. except this weekend she's with friends out and about I think! Good for her ..
Am so glad to read this post today! It just makes your infectious joy shine through! Jannies and Jan are my two favorite ladies...and its true..each have their own uniqueness...their comments can inspire and make us chuckle. What a combo you have chosen for this post. o, my grate goodniss!!! my jannie wil be sooooo escited about this, hilry!!!!! I must wakes her up so she can hurrie and reed so mutch honors and loves yoo haz putted into werds here! hoo-woo!! ma jannie!! my jannieeee!!!!! wakes up, hurrie!!!!! wow, that's even too big a werd for me! and i reel reel smart!!! yoo in brittin does not say "wedgie' for when your unmenshunables gets up where they shood not get up to?? we stil loves you in amerika!! Blushing, blushing, blushing, am I!! I thank you so much for all kind words, sentiments, musings and ragingly glorified articulations here on my behalf. I thank you, humbled much indeed. o, hillry!!! I totilly forgotted to menshun -- evry day now i eets evry karrit in 13 bites, in your honors. Passing thru. Sorry for your comment posting problems! Hi Zeenat - thank you and I’m so glad you caught the infection! Jannie and Jan – well they engineered this from the prize .. and then the prezzie on its arrival – a special day. It is fantastic that there’s always a cheerful comment somewhere, something to make us just have as you say a chuckle. Good to see you here .. I obviously didn’t click your RSS box – I thought I’d done .. so that’s why I haven’t been over recently .. I’m going to correct that now – otherwise I’ll have ‘em two women coming in my direction, with BB close behind .. an awesome combination .. especially as BB now munchies his food in 13 bites .. if his diet changes while he chases me – I’m a worried woman! Lovely to see you here - I’m putting that digression away now .. on over to you .. Hilary !! Hi Blue Bunny – gosh you have been busy today .. thank you for all your commenting ..
@ BB 'prognosticator' .. oh dear I too had to check it was a proper word .. and it was – so in it went .. but clever BB picked it up – you are reel smart: you learnt a new word today ..
@ Jan – yes – she sure does have bootiful teethlipegs doesn’t she?! ‘Dem earry rings match too! @ BB – did you relly wake memsahib up from her booty sleep .. I’m the one that’s honoured now. Not bad I ‘spose .. ten minutes later she’s here!! @BB & U’re nows takin 13 (magic number) bities on evry karrit .. goodly dijestin now I reckons .. I am honoured – I’se have a Kraft Dairy Milk medal now .. (no longer Cadbury’s – now Krafties have taken over our choccy business!). @ Jannie .. I was on a train getting rocked and rolled and losing connection – not easy to comment on an iphone in a train!! So failed. Had been up north to cold gray Leeds, across Arkwright’s factory land .. so that was quite interesting ..though it was so dark and gloomy! Just delighted with your many comments and sending BB to do your duty – though mind you I hope you’re beautiful today .. as he woke you up rather early??? Jannie .. many thanks for the CD – I’m loving it – had it on since I got home ..
Love to you and BB .. all!! And the karrits ..get that baby girl singing a bit more .... Hilary !! It appears to me that you are in the company of fun folks! Congrats on your win! Thanks for the wonderful reminder to wear a smile for the rest of my weekend! I have to say congratulations on winning that nice CD. I love Jannie, Jan, and BB. I'm happy for you and for them. I know it gave them joy to gift it to you. Big hearts in all of them. Thank you for coming by with your very deep comment. I agree, my mistakes made me grateful. I am grateful for all things good and bad because I can use them to change my life or guide someone with insight they may not have considered. Hi Ji .. thank you for popping over .. not sure I’m in rhyming mode at the moment .. so really grateful for the two comments and verses .. it makes life fun – and amusing to us all who read your comments .. and the compliments = thank you!! Hi Ji .. again .. many thanks – you are right - it is lovely to appreciate all those great bloggers out there - and as you say let’s keep blogging, keep smiling, keep caring and keep encouraging .. – good to see you ..
Hi Angelia .. good to see you here .. yes I was lucky ... it is a good time .. and Jan, Jannie & BB are pretty special .. as are lots of others – and as you so rightly describe them “The Big Hearts Brigade!!”. Hi Paul .. good to see you - it's certainly an important time of the year, particularly for the Church .. but perhaps the decorations have only just come down .. I got my mother's down in time: people were castigating me for not taking them down .. but I enjoyed them & saw the European tradition of Candlemas being the last day possible - I thought I'd enjoy them a while longer!! Jannie is famous for making others laugh. We will all we saying, "We knew her when... someday soon." Hi Tess .. it's so good to know Jannie - she lights up so many lives; and Jan - well calm wonderful Jan .. so caring for others. If we don't say your words for Jannie .. I just think we might for Kelly the songstress .. who doesn't care if she forgets her words - jsut says 'oh yes' and carries on - bliss! Hi William .. good to see you - especially as you're in Sussex .. your poetry is fun. It's lovely to have the sunshine award from Ji - especially in this grey, turning to white during the week, weather .. thanks for popping over ..
Hi Sara .. thank you - she is so generous and so much fun for us all to share in her enthusiastic humour. Jan offers so much. BB is a special favourite here with my Ma and Hardwick .. her 'real-life' dog .. so we always enjoy having him around & it's fun to speak ze Afrikaaaaaanze type lingo ..
Jannie is indeed an uplifting spirit. 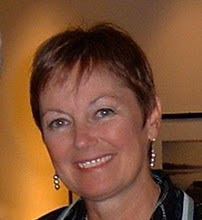 I also interview her on the dreambuilders Australia Blog and on my Dreambuilders Australia Blog Talk Radio Show. She has a joyful presence that encourages and inspires everyone to hae new faith in themselves and their creative outlets. February – the half-way month ..